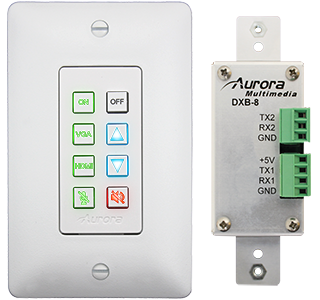 News - 8 button Gang Wall Controller | Aurora Multimedia Corp.
Aurora’s DXB-8 low-cost 8-button 1-Gang Wall Controller will keep your budget on Santa’s Good list! The DXB-8 has 8 programmable buttons and two RS232 ports for controlling RS232 devices. Perfect for classrooms and small conference rooms, the DXB-8 buttons can be configured for sending commands on both a press and/or release, making it ideal for applications such as camera pan/tilt near/far commands, as well as press-and-hold functionality for volume ramping applications. For added functionality and getting more bang-for-the-buck each button can also be programmed as a toggle function sending a unique serial command on the first press and a totally different command on a second press (I.e. Display Power On and Display Power Off both under the same button). Each of the 8-buttons are backlit with programmable colors (red, green and blue). Different colors can be placed onto a single button showing one color on a press and another on a release or toggle between two as well. The DXB-8 comes in black and white with an assortment of laser-etched backlit buttons. Over 50 additional buttons are available to choose from and custom buttons can be created. With Aurora’s free DXI programming software, the DXB-8 can easily be programmed within a single page for easy viewing of the entire project. 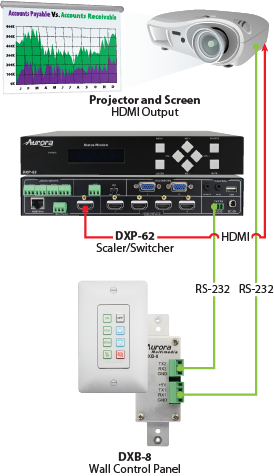 The DXB-8 also mates with Aurora’s award winning DXW-2 series HDBaseT wall plates allowing RS232 control via HDBaseT to the display over a single umbilical.